There’s a fine line between collecting and hoarding, and Courtney Creighton knows it. 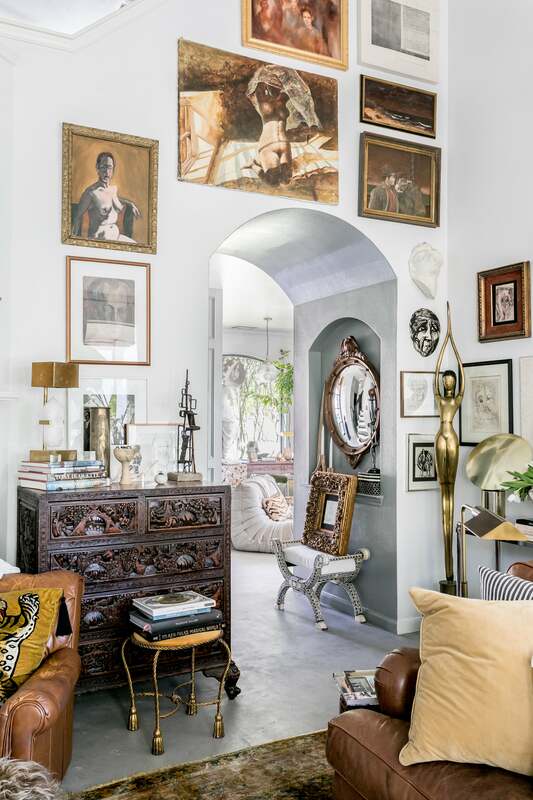 Her home in League City, Texas, is like a museum, the product of years of careful curating and a talent for constant editing—every single antique addition is intentional. Despite the 2,700-square-foot home’s current maximalist style (the descriptor “unique” doesn’t come close to doing it justice), it wasn’t always this way. The incredibly cool, gallery-like interior was once floor-to-ceiling beige. No, really. You might even say that her house was her first vintage shop. Creighton has been collecting for as long as she can remember. She credits her passion to a bust currently perched on the fireplace—a Craigslist find she scooped up for $10 that she says sparked a hunger to keep hunting for one-of-a-kind pieces. Now a seasoned pro, she sells on sites like Chairish and keeps a lot of her inventory in storage. With three kids, she’s conscious of maintaining a balance between gallery and home: While the space definitely has its museum-like qualities, it never feels impersonal. Her taste, like the contents of her home, is constantly evolving, and in the process of curating her space and pinpointing her personal style, Creighton has effectively fine-tuned the vintage decor hunt down to an art form. Which is why we figured there’s no better person to shed some light on the world of antique shopping—you’ll want to bookmark these tips for the next time you go to a market or a Goodwill. Before you accidentally panic-buy the first vase you see. “Go to the large furniture sections first, because those are going to be the first things to catch anyone’s eye,” says Creighton. After you’ve rifled through the big-ticket items, then turn your attention to knickknacks or decor—unless, of course, something immediately catches your eye. Any legit dealer should easily be able to answer any and all questions you have as to the specifics of a product. The biggest question to ask? “‘Do you know where it came from?’” says Creighton. “If they say an estate sale, ask what other types of items the person had.” A seller who knows their product and has clearly invested time and effort into tracking it down usually means a more high-quality piece.